I'm feeling pretty pleased with myself right now, as my container garden is beginning to produce some really delicious booty! The green, jalapeno and Caribean peppers are in full bloom, we have herbs galore (basil, parsley, sage, rosemary, mint, thyme), and an unbelievably abundant tomato plant -- called a patio tomato and bred to grow in containers -- as well as a not so abundant but heirloom zebra tomato plant that's doing quite well especially considering the late season tomato blight tomato killing fungus that has hit the Northeastern US (the latest news indicates the tomato blight is spreading to potato plants and in regions as far as Wisconsin and that nearly 50% of the New York State tomato crop has been wiped out this year). Read more about late blight on Long Island in this recent article in Newsday. Note that Garden of Eve in Riverhead has lucked out so far and has an abundance of tomatoes. My cucumbers were crisp and tasty but didn't do very well growing in a container -- I suspect the roots need a larger area to spread out. And, our bad breath puppy, Dixie, ate all the scallions, onions and chives -- go figure! Next year, I want to go back to a vegetable garden in the ground but I know I'll need to invest in a protective fence because last year the deer came into the yard and devoured everything! I also want to try my hand at some more heirloom tomatoes despite my success with the hybrid patio tomatoes since heirlooms are far more delicious (although much harder to grow) and much more in line with being a lighthearted locavore gardener. 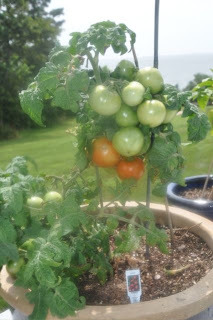 And, besides my tomatoes only need to travel 20 feet from patio to plate. There are literally hundreds of varieties of tomato plants -- red, yellow, green, black, cherry, plum -- grown from heirloom or hybrid seeds. What's the difference? Heirloom seeds are essentially non-hybrid seeds that have never seen a plant breeding laboratory but rather have been carefully collected, dried and saved through the generations. In other words they have not been genetically modified, spliced or bred. Today, pretty much all of the tomatoes that are cultivated are grown from hybrid seeds so they can travel long distances and fight off pests and disease as heirloom tomatoes tend to be quite fragile and split open due to their thinner skins and are less resistant to disease. There's a rise in heirloom tomato growing thanks to the farm to table locavore movement sweeping across the country. Many growers participate in late summer and early fall heirloom tomato festivals -- that are up there with local grape harvests and olive oil pressings in Europe -- to celebrate their bounty. Heirlooms have names like Green Zebra, Brandywine, Julia Child and Yellow Submarine. A good resource for buying heirloom tomato seeds and video on how to save seeds for next season.